Gastric dilatation and volvulus (GDV) is an acute, life-threatening disorder in dogs, characterized by abnormal twisting of the stomach on its mesenteric axis, with subsequent gastric gas accumulation and distention. Sequelae of GDV can include decreased venous return to the heart, hypovolemia, gastric ischemia, systemic hypotension, myocardial injury, portal hypertension, shock, sepsis, and disseminated intravascular coagulation. Abdominal radiography, particularly the right lateral projection, is diagnostic for GDV. A healthy dog typically has no gas in the pylorus in right lateral recumbency. Conversely, in a dog with GDV, the stomach is dilated with gas, and radiography depicts the hallmark sign of compartmentalization (the “double bubble”) that signifies craniodorsal displacement of the pylorus, as shown in Figure 1. Ideally, an orthogonal projection (dorsoventral view) is also acquired, depending on patient stability. Presence of pneumoperitoneum suggests gastric rupture. Ideal blood analysis consists of complete blood count, serum chemistry, and a coagulation profile. Efficiently obtaining the results from these diagnostic tests is sometimes not possible; therefore, point-of-care assessment is often more practical: packed cell volume/total solids; blood glucose; and venous blood gas, including electrolytes and lactate. Lactate, a marker of hypoperfusion and anaerobic metabolism, has been evaluated as a prognostic tool in patients with GDV. Study findings are summarized in Table 1.11–14 Overall, higher lactate values are more suggestive of gastric necrosis and have a negative correlation with survival, particularly if hyperlactatemia does not substantially improve after fluid resuscitation. Regardless of the lactate value, surgical intervention is always recommended. Blood pressure and electrocardiography (ECG) are useful diagnostic tools to assess patient stability, monitor effectiveness of volume resuscitation, and evaluate for cardiac arrhythmias (see Preoperative Treatment and Stabilization). For most patients, especially those that are severely affected, stabilization and treatment must be performed before or in conjunction with diagnostic testing. Immediate treatment goals are correction of hypovolemia and gastric decompression. Box 2 summarizes therapeutic measures to consider during stabilization of a patient with GDV. Prompt vascular access is obtained with large-gauge, short IV catheters (16 or 18 gauge). Cephalic veins or jugular veins should be used because of the lack of blood flow from the caudal half of the body. Initial volume resuscitation with a balanced isotonic crystalloid solution is recommended. Initial fluid volumes should be administered in rapid boluses of one-third to one-quarter shock volumes. Monitoring perfusion parameters (Box 3) after fluid boluses is important in assessing response to therapy. Additional fluid boluses and addition of synthetic colloid boluses or hypertonic saline may be required, depending on individual patient needs. Gastric decompression should be performed as soon as possible. This can be achieved by passing a smooth-surfaced orogastric tube or via percutaneous trocharization. When an orogastric tube is passed in an awake patient, sedation (with a pure mu agonist opioid) is typically required, as is holding the patient’s mouth open with a roll of tape or gauze between the incisor teeth. Alternatively, the orogastric tube can be passed with the patient under general anesthesia; the presence of an endotracheal tube will help limit the risk for accidental aspiration of gastric contents. Before an attempt to pass a gastric tube, the tube should be lubricated and premeasured to the level of the last rib. Twisting the tube when slight resistance is felt can facilitate passage of the tube into the stomach; however, caution must be used to avoid perforating the esophagus. When passing the gastric tube is difficult, decompression via trocharization may facilitate passage. After successful passage of the tube, observation of hemorrhage or mucosal tissue in the gastric contents can provide an index of suspicion of gastric necrosis and mucosal sloughing. Trocharization can be performed in an awake or anesthetized patient: To perform trocharization, an area of skin on either side of the cranial dorsolateral abdomen should be clipped and aseptically prepared before puncture of the skin, body wall, and stomach with a large-bore needle (ie, 14 gauge) or over-the-needle catheter. The site of greatest distention or greatest tympany can be used. Gas and liquid may escape; pressure can be applied to the body wall to facilitate decompression. A rationale exists for the use of antibiotics in patients with GDV: there is the presumed risk for bacterial translocation with gastric mucosal compromise and increased mucosal permeability, as well as venous stasis and poor hepatic perfusion, likely resulting in inhibition of reticuloendothelial function. Ventricular arrhythmias are reported in up to 40% of dogs with GDV; therefore, continuous ECG should be monitored.1 Ventricular arrhythmias that could decrease cardiac output or develop into ventricular fibrillation (specifically, ventricular tachycardia, R-on-T phenomenon, or multiform ventricular premature contractions) should be treated with IV lidocaine boluses initially, followed by a constant rate infusion if the bolus is successful in converting the rhythm to a sinus rhythm. If lidocaine is not successful in converting the rhythm, procainamide or sotalol can be administered (Box 2). When possible, complete fluid resuscitation (characterized by normalization of perfusion measures listed in Box 3) should be attempted before surgery because increased time from presentation to surgery has been associated with a lower mortality rate.17 Survival is positively affected by the time spent adequately stabilizing the patient; however, surgery should always be performed in a timely manner to limit the duration of splenic and gastric ischemia. General anesthetic protocols vary depending on patient status; anesthetic agents that are arrhythmic or cardiac depressants should be avoided. Typical premedications consist of a pure mu agonist opioid and a benzodiazepine, induction agents (such as etomidate or propofol), and an inhalant to maintain anesthesia. Monitoring of response to treatment and adjusting fluid therapy accordingly are still crucial during the intraoperative period. Survival is positively affected by the time spent adequately stabilizing the patient; however, surgery should always be performed in a timely manner to limit the duration of splenic and gastric ischemia. Reposition the abnormally positioned stomach. Typically, a clockwise volvulus has occurred; therefore, the fundus can be pushed dorsally while pulling the pylorus ventrally and toward the right. Critically evaluate the abdominal viscera. Allow time for organs to reperfuse, and confirm correct gastric positioning. If necessary, perform partial gastric resection or splenectomy to remove necrotic tissue. Perform a right-sided gastropexy to create a permanent adhesion between the pyloric antrum and the adjacent right body wall. A ventral midline celiotomy is performed. Adequate exposure is essential and the incision should extend from xiphoid to pubis. When the surgeon first enters the abdomen, the greater omentum is usually covering the stomach and should be gently retracted. Derotation of the stomach is facilitated by decompressing the gas distention, either by the anesthetist passing an orogastric tube or by the surgeon evacuating the air with a large-gauge needle. The typical direction of volvulus is clockwise, with rotation of 180° to 270° being most common. In most cases, the stomach can be repositioned with the surgeon standing on the dog’s right side to push the fundus dorsally and to the dog’s left while simultaneously gently pulling the pylorus (located on the left initially) ventrally and toward the surgeon on the right. After repositioning, confirmation of normal gastric position is crucial. Although rare, a counterclockwise volvulus or a rotation through a rent in the splenic mesentery is possible, so the surgeon should always verify correct stomach positioning via careful observation and palpation of the gastroesophageal junction. There is often free peritoneal blood due to avulsion of the short gastric arteries and veins when the stomach distends and rotates. Bleeding has typically ceased by the time of surgery, but if hemorrhage is ongoing, these vessels should be ligated. It is important to allow time for organs to reperfuse after gastric repositioning and before performing splenectomy or partial gastrectomy. The stomach should be palpated for any evidence of foreign material,4 and the entire stomach, especially the greater curvature and dorsal aspect, should be carefully evaluated for necrosis. Gastric necrosis is reported in 13% to 20.5% of patients.1,17–19 Necrotic areas can be identified by their black, grey/white, or green serosal color; thin texture on palpation; or lack of serosal capillary perfusion. If gastric necrosis is present, placement of stay sutures in visibly normal tissue helps to manipulate the stomach, plan gastric resection, and limit potential spillage of gastric contents into the abdomen. Partial gastrectomy can be performed via resection and hand-sewn 2-layer closure or by using surgical stapling equipment. All nonviable tissue should be resected; normal tissue will have bleeding from the cut surface, particularly the muscularis layer. The appearance of the mucosal tissue should not be used to guide resection. The limiting factor for the surgeon’s ability to perform resection is the anatomic location of necrosis and concern for esophageal lumen diameter, specifically when necrotic areas involve the cardia and esophagus. The need for splenectomy because of irreversible vascular devitalization or thrombosis is reported in approximately 16% to 22% of patients.17–19 A nonviable spleen has a spongy texture, lack of pulse in the splenic artery, and a black or grey color that does not improve after gastric repositioning. Splenectomy may be performed using ligation, stapling equipment, or vessel sealant devices. Right incisional gastropexy is the most commonly performed technique because of its technical ease, low risk of morbidity, no need for additional instrumentation, and effective production of a permanent adhesion.24 The site of gastropexy is first planned by manually apposing the stomach to the body wall to ensure an anatomically appropriate site. To aid in visualization, the Balfour retractor can be removed, and assistants standing on the right side of the dog can retract the abdominal wall with towel clamps or Army-Navy retractors. The surgeon can change position at the table and stand on the dog’s left side for improved access for suturing. An incision is made along the right body wall, completely through the transversus abdominis muscle. The incision can be oriented vertically or horizontally, as demonstrated in Figure 2. It is important for the incision to be located caudal to the last rib to prevent penetration of the diaphragm and subsequent pneumothorax. The incision should be located dorsal enough to be in an anatomic position, as well as to avoid interference with abdominal closure or decrease risk for inadvertent damage to the stomach if future laparotomy is performed. FIGURE 2. These images depict the initial step in right incisional gastropexy in 2 separate patients. The cranial aspect of each dog is oriented to the right of the photograph. An incision is made through the transversus abdominus muscle on the right body wall, caudal to the last rib to avoid incising the diaphragm and dorsal enough to maintain an anatomic position. The incision can be oriented vertically (A) or horizontally (B). Next, an incision of similar length is made in the seromuscular layer of the stomach at the level of the pyloric antrum. A location on the stomach without visible vasculature is chosen. Figure 3 demonstrates the completed incision and the ability to appreciate the difference between the seromuscular layer and the underlying mucosa/submucosal layer. FIGURE 3. The second step during right incisional gastropexy is an incision through the seromuscular layer of the stomach, at the level of the pyloric antrum. The incision can be made longitudinally (depicted) or transversely, taking care to avoid the prominent vasculature along the omental attachment to the stomach. 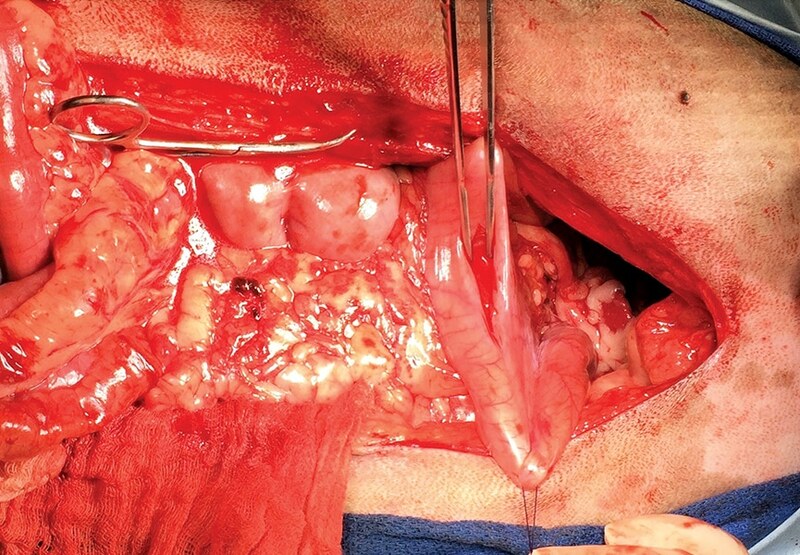 In this image, the cranial aspect of the dog is oriented to the right and the underlying mucosal/submucosal layer of the stomach is differentiated with a forceps. Two rows of sutures are placed, typically in simple continuous fashion, beginning at the craniodorsal aspect of the respective incisions, as demonstrated in Figure 4. The deep edge of the transversus abdominis incision is sutured to the deep edge of the gastric seromuscular incision, with care taken to make wide bites (at least 3 mm) on each side. Typical suture choice is a 2-0 monofilament long-lasting absorbable suture material. After completion of the first suture line, a second suture line is performed in identical fashion to oppose the superficial or ventral aspect of the respective incisions. The completed gastropexy is shown in Figure 5. FIGURE 4. In these images, the cranial aspect of the dog is oriented to the right, and the surgeon is standing on the left side of the dog to improve visualization and ease of suturing. In A, the suturing is started with the dorsal (deep) side of the respective incisions; suturing in a cranial-to-caudal direction is most efficient for a right-handed surgeon. In B, the dorsal (deep) side of the gastric seromuscular incision is sutured to the dorsal side of the transversus abdominus incision. Assistants standing on the dog’s right side can help improve visualization by retracting the abdominal wall with towel clamps and pushing in to provide tension on the body wall. FIGURE 5. Completed right incisional gastropexy. In A, the cranial aspect of the incision is oriented to the right. B is a laparoscopic image after completion of a laparoscopic-assisted right incisional gastropexy. Postoperative treatment is typically a continuum of care from pre- and intraoperative therapy. Continued volume resuscitation may include IV isotonic crystalloids (90–120 mL/kg/day); colloids, such as hydroxyethyl starch (10–30 mL/kg/day); and fresh frozen plasma or other blood products, depending on individual patient needs. For analgesia, injectable opioids are recommended. Nonsteroidal anti-inflammatory drugs are avoided because of the decreased gastric perfusion associated with GDV and the high possibility of gastric ulcers. Gastroprotectants, such as sucralfate, histamine-2 receptor antagonists, or proton-pump inhibitors, can be administered. Antibiotic administration for 2 to 3 days after surgery is often indicated based on the presumed risk for bacterial translocation. Postoperative monitoring includes blood pressure, urine output, and emesis watch. Gastric atony and delayed gastric emptying can occur after gastric dilatation, so antiemetics or prokinetics can be administered if vomiting or regurgitation is observed postoperatively. Continuous ECG should be closely monitored because more than half to three-quarters of patients experience postoperative arrhythmias within the first 12 to 24 hours after surgery,17,19 although not all patients require antiarrhythmic therapy. Repeated blood analysis and electrolyte measurement help to guide fluid therapy. Rechecking coagulation profiles may be warranted in patients at risk for disseminated intravascular coagulation. Food and water may be offered several hours after surgery to an awake, alert patient. The immediate goals of stabilization of a patient with GDV are fluid resuscitation to correct hypovolemia and gastric decompression to make the patient as stable as possible for anesthesia. Surgical goals are prompt gastric repositioning, critical evaluation of the abdominal viscera, and right-sided gastropexy. With timely surgery, the prognosis for most patients is fair. Negative prognostic indicators include gastric perforation, the need for splenectomy and partial gastrectomy, lactate levels that do not respond to fluid resuscitation, and preoperative arrhythmias. Brockman DJ, Washabau RJ, Drobatz KJ. Canine gastric dilatation/volvulus syndrome in a veterinary critical care unit: 295 cases (1986-1992). JAVMA 1995;207(4):460-464. Glickman LT, Glickman NW, Schellenberg DB, Raghavan M, Lee T. Non-dietary risk factors for gastric dilatation-volvulus in large and giant breed dogs. JAVMA 2000;217(10):1492-1499. Schellenberg D, Yi Q, Glickman NW, Glickman LT. Influence of thoracic conformation and genetics on the risk of gastric dilatation-volvulus in Irish setters. J Am Anim Hosp Assoc 1998;34(1):64-73.
de Battisti A, Toscano MJ, Formaggini L. Gastric foreign body as a risk factor for gastric dilatation and volvulus in dogs. JAVMA 2012;241(9):1190-1193. Pipan M, Brown CD, Battaglia CL, Otto CM. An Internet-based survey of risk factors for surgical gastric dilatation-volvulus in dogs. JAVMA 2012;240(12):1456-1462. Theyse LFH, van de Brom WE, van Sluijs FJ. Small size of food particles and age as risk factors for gastric dilatation volvulus in great danes. Vet Rec 1998;143(2):48-50. Braun L, Lester S, Kuzma AB, Hosie SC. Gastric dilatation-volvulus in the dog with histological evidence of preexisting inflammatory bowel disease: a retrospective study of 23 cases. JAAHA 1996;32(4):287-290. Raghavan M, Glickman N, McCabe G, Lantz G, Glickman LT. Diet-related risk factors for gastric dilatation-volvulus in dogs of high-risk breeds. JAAHA 2004;40(3):192-203. Sartor AJ, Bentley AM, Brown DC. Association between previous splenectomy and gastric dilatation-volvulus in dogs: 453 cases (2004-2009). JAVMA 2013;242(10):1381-1384. Glickman LT, Lantz GC, Schellenberg DB, Glickman NW. A prospective study of survival and recurrence following the acute gastric dilatation-volvulus syndrome in 136 dogs. JAAHA 1998;34(3):253-259.
de Papp E, Drobatz KJ, Hughes D. Plasma lactate concentration as a predictor of gastric necrosis and survival among dogs with gastric dilatation-volvulus: 102 cases (1995-1998). JAVMA 1999;215(1):49-52. Zacher LA, Berg J, Shaw SP, Kudej RK. Association between outcome and changes in plasma lactate concentration during presurgical treatment in dogs with gastric dilatation-volvulus: 64 cases (2002-2008). JAVMA 2010;236(8):892-897. Green TI, Tonozzi CC, Kirby R, Rudloff E. Evaluation of initial plasma lactate values as a predictor of gastric necrosis and initial and subsequent plasma lactate values as a predictor of survival in dogs with gastric dilatation-volvulus: 84 dogs (2003-2007). J Vet Emerg Crit Care 2011;21(1):36-44. Beer KA, Syring RS, Drobatz KJ. Evaluation of plasma lactate concentration and base excess at the time of hospital admission as predictors of gastric necrosis and outcome and correlation between those variables in dogs with gastric dilatation-volvulus: 78 cases (2004-2009). JAVMA 2013;242(1):54-58. Green JL, Cimino Brown D, Agnello KA. 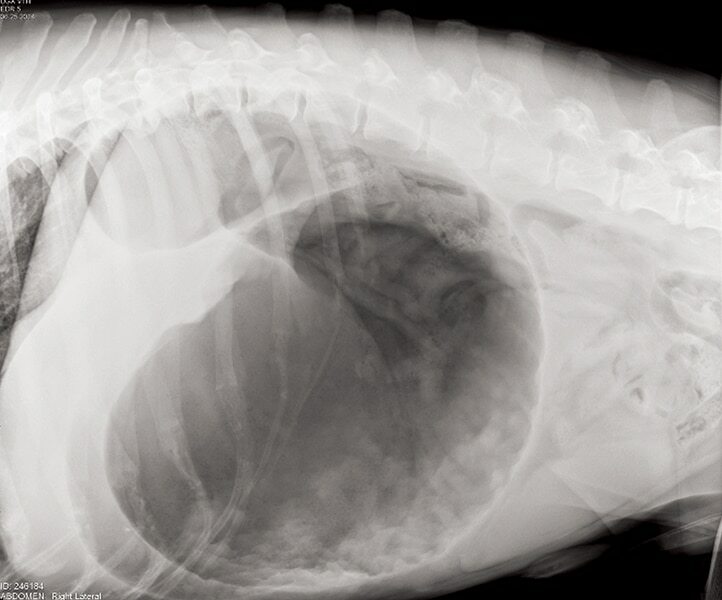 Preoperative thoracic radiographic findings in dogs presenting for gastric dilatation-volvulus (2000-2010): 101 cases. J Vet Emerg Crit Care 2012;22(5):595-600. Buber T, Saragusty J, Ranen E, et al. Evaluation of lidocaine treatment and risk factors for death associated with gastric dilatation and volvulus in dogs: 112 cases (1997-2005). JAVMA 2007;230(9):1334-1339. Mackenzie G, Barnhart M, Kennedy S, DeHoff W, Schertel E. A retrospective study of factors influencing survival following surgery for gastric dilatation-volvulus syndrome in 306 dogs. JAAHA 2010;46(2):97-102. Brourman JD, Schertel ER, Allen DA, Birchard SJ, DeHoff WD. Factors associated with perioperative mortality in dogs with surgically managed gastric dilatation-volvulus: 137 cases (1988-1993). JAVMA 1996;208(11):1855-1858. Beck JJ, Staatz AJ, Pelsue DH, et al. Risk factors associated with short-term outcome and development of perioperative complications in dogs undergoing surgery because of gastric dilatation-volvulus: 166 cases (1992-2003). JAVMA 2006;229(12):1934-1939. Sutton JS, Steffey MA, Bonadio CM, Marks SL. Gastric malpositioning and chronic, intermittent vomiting following prophylactic gastropexy in a 20-month-old great Dane dog. Can Vet J 2015;56(10):1053-1056. Eggertsdóttir AV, Stigen Ø, Lønaas L, et al. Comparison of the recurrence rate of gastric dilatation with or without volvulus in dogs after circumcostal gastropexy versus gastrocolopexy. Vet Surg 2001;30(6):546-551. Hardie RJ, Flanders JA, Schmidt P, et al. Biomechanical and histological evaluation of a laparoscopic stapled gastropexy technique in dogs. Vet Surg 1996;25(2):127-133. Wilson ER, Henderson RA, Montgomery RD, et al. A comparison of laparoscopic and belt-loop gastropexy in dogs. Vet Surg 1996;25(3):221-227. Wacker CA, Weber UT, Tanno F, Lang J. Ultrasonographic evaluation of adhesions induced by incisional gastropexy in 16 dogs. J Small Anim Pract 1998;39(8):379-384. Meyer-Lindenberg A, Harder A, Fehr M, Luerssen D, Brunnberg L. Treatment of gastric dilatation-volvulus and a rapid method for prevention of relapse in dogs: 134 cases (1988-1991). JAVMA 1993;203(9):1303-1307. Benitez ME, Schmiedt CW, Radlinsky MG, Cornell KK. Efficacy of incisional gastropexy for prevention of GDV in dogs. JAAHA 2013;49(3):185-189. Przywara JF, Abel SB, Peacock JT, Shott S. Occurrence and recurrence of gastric dilatation with or without volvulus after incisional gastropexy. Can Vet J 2014;55(10):981-984. Hammell SP, Novo RE. Recurrence of gastric dilatation-volvulus after incisional gastropexy in a Rottweiler. JAAHA 2006;42(2):147-150. Desiree Rosselli, DVM, DACVS (Small Animal), is a surgeon at VCA West Los Angeles Animal Hospital. She received her doctor of veterinary medicine degree from the University of California Davis. She completed a rotating internship at the University of Wisconsin-Madison, a surgical specialty internship at Dallas Veterinary Surgical Center, and a residency in small animal surgery at the University of Georgia. Following her residency, she was employed as a clinical instructor at the University of Georgia.